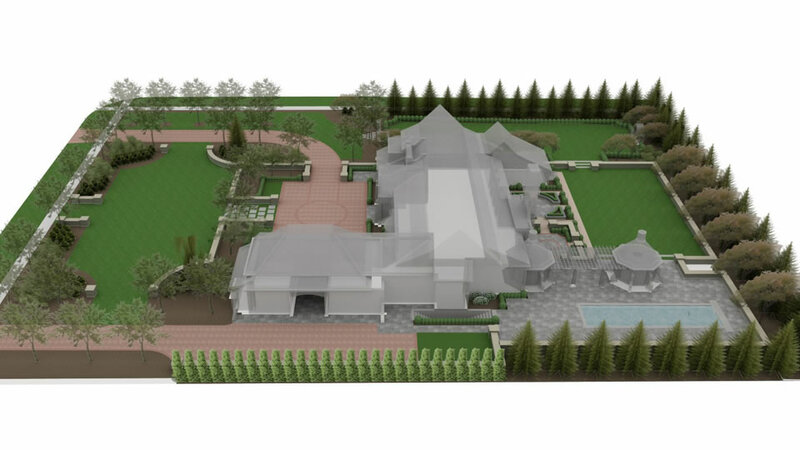 Drawing inspiration from extensive travel, this client incorporated elements of a European Country Estate into the design of their home’s architecture. 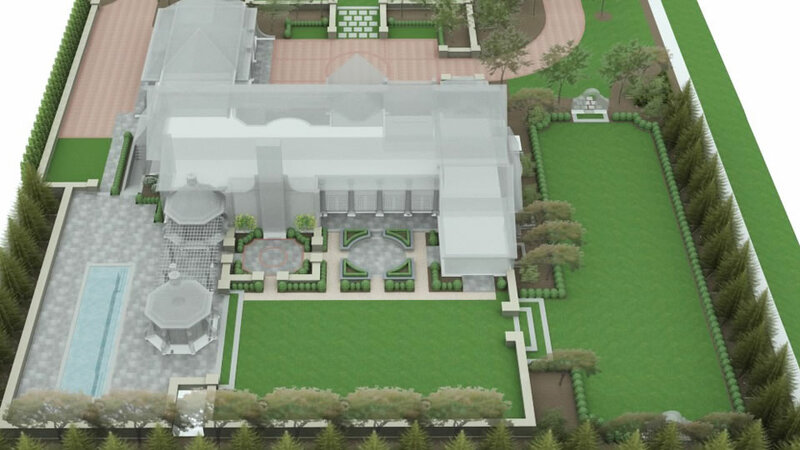 This concept of the “country estate” became the driving force behind the ideas that shaped the structure and formality present in this grand, yet simple design. 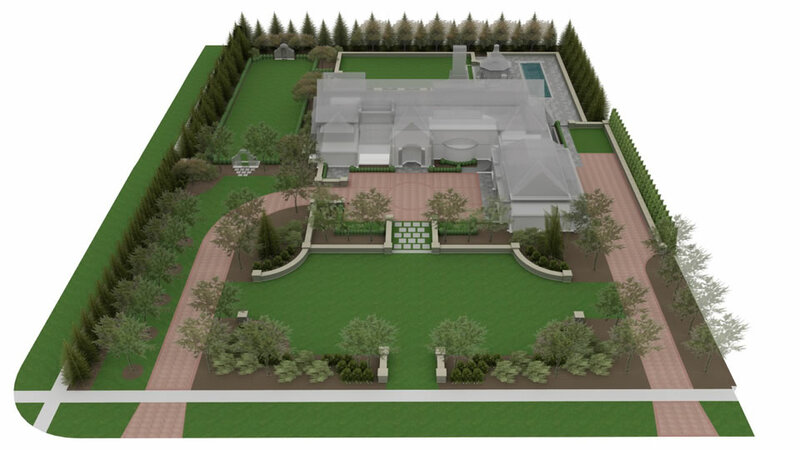 Entertainment spaces were to be large and open, yet private from the surrounding neighbors. The smaller gatherings spaces were to be intimate and relaxing, allowing the old world character and details to be become the focus of the garden. 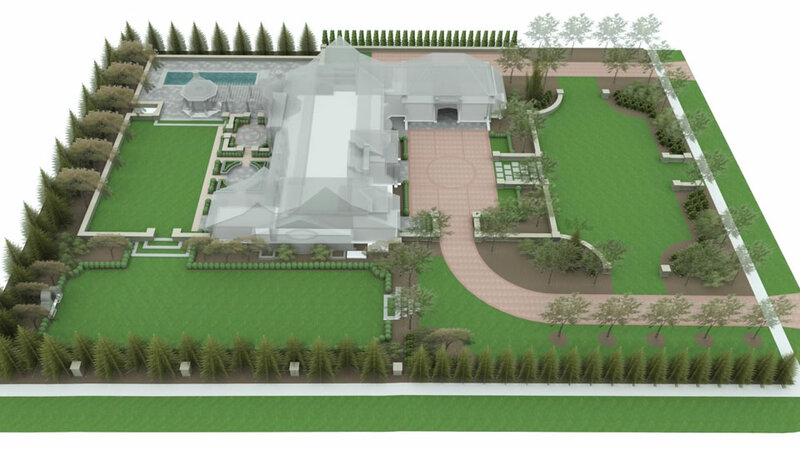 Imagining a design that could allow for a simple, structured, formal layout that also focused on the specific details of each space was no small task. 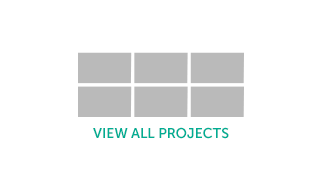 Many elements were considered, and how these elements interacted with the potential users and passersby were discussed, visualized and refined time and again. 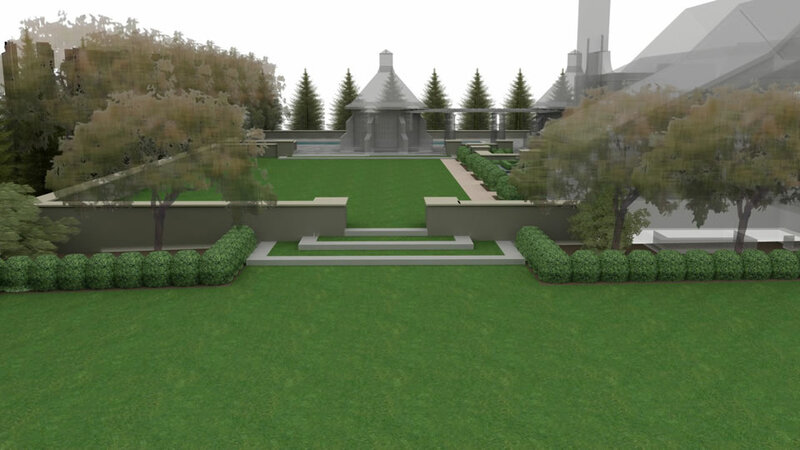 The final development of the design included low masonry walls that defined the borders and lead one through the designed spaces, providing enclosure to the expansive turf zones, back yard patios and planting beds. 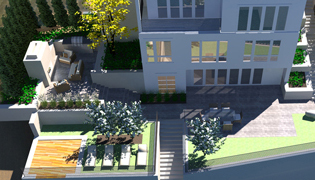 Their low stature and rectilinear orientation in the front yard strengthen the visual axis to the front entrance. Raised antique pavers form a curb along the paver driveway, shaded by linear rows of immense Maple trees. A gated stone archway entices visitors into the manicured side lawn panel, surrounded by specimen evergreens and flowering trees. 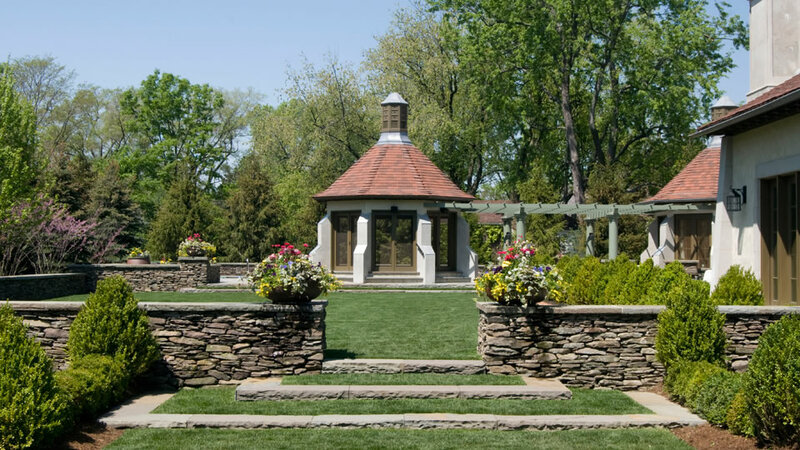 Across the lawn panel, a matching arched stone alcove houses a tastefully appointed flower arrangement and serves as the properties’ conversation piece. 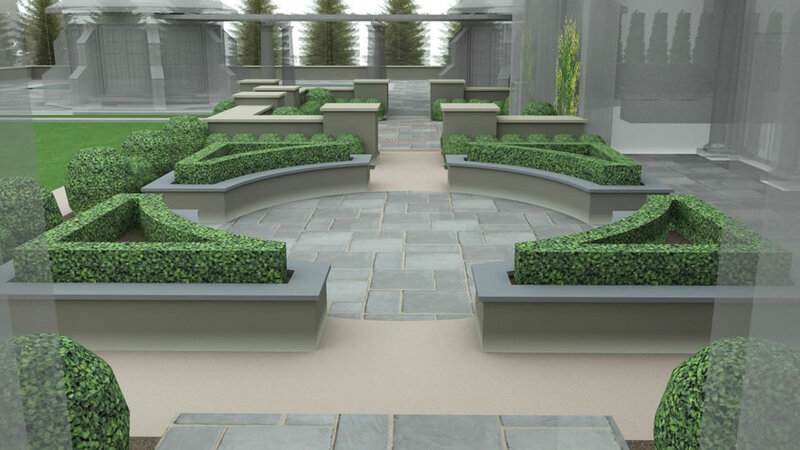 Bluestone snapped steps ascend to the formal, recreational turf panel, rear terraces and granite chip paths. 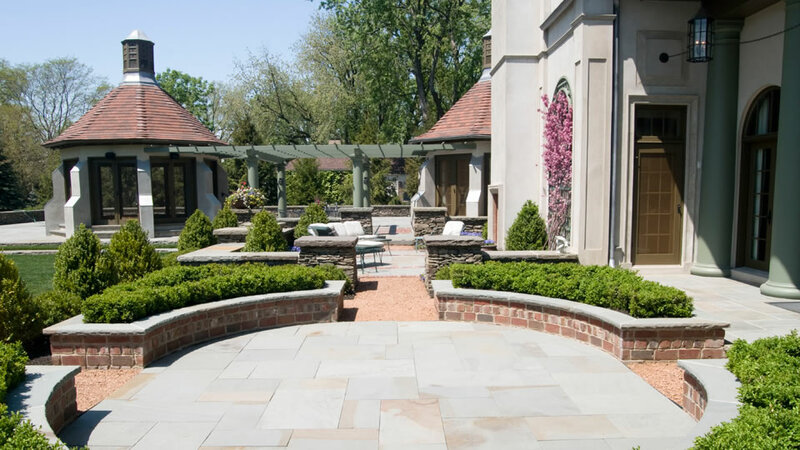 Flowering espaliers flank the outdoor fire place, providing color and texture to the house walls while the expansive pergola, custom gazebo and in-ground pool offer reprieve from the hot summer sun. 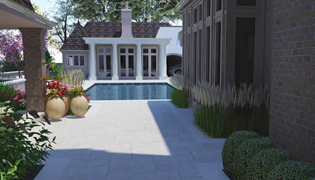 In addition to the aesthetic decisions that form this estate, the need for a drainage solution that could alleviate the water issues of the property became apparent. 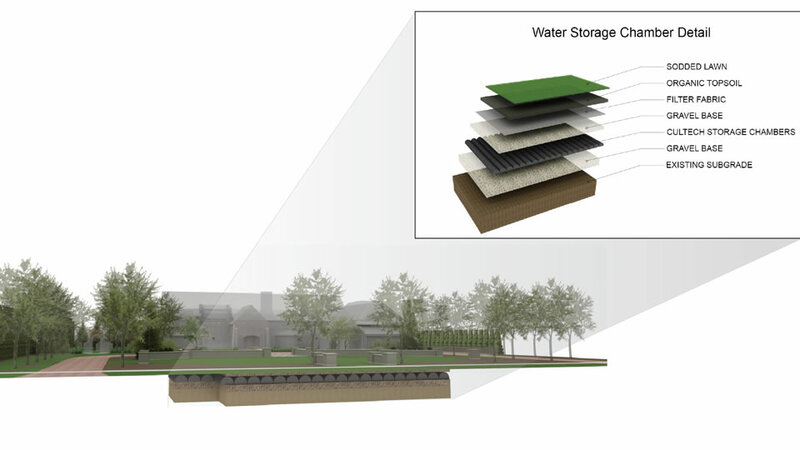 Thoughtfully addressing these concerns using the newest technology, a complex subterranean water collection system was designed with functional and environmental goals in mind. By responsibly mitigating surface water runoff, we were able to control and minimize the amount of water the property was previously discharging into the already over-taxed city sewer system, and the massive amounts of water being collected is used to irrigate the property, greatly reducing the need for city water.